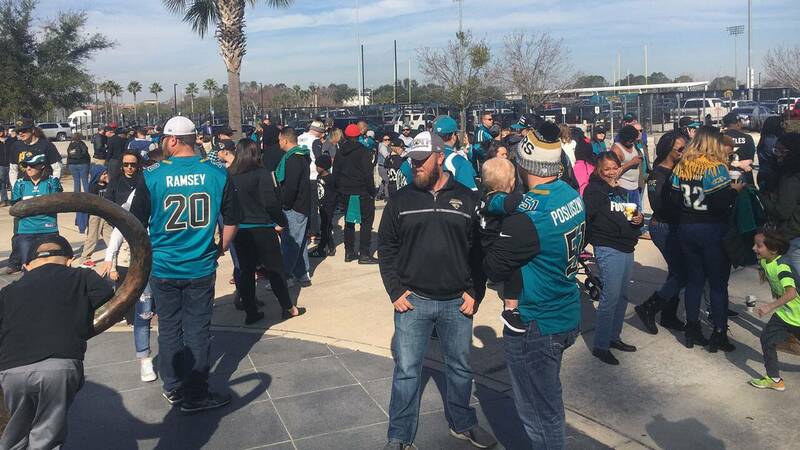 JACKSONVILLE, Fla. - Hundreds of members of the Bold City Brigade held a huge send-off for the Jacksonville Jaguars Saturday outside EverBank Field as the team made its way up to New England for their AFC Championship matchup against the Patriots. There was a unanimous belief among attendees that the Jags will go into Foxborough Sunday and bring back the first AFC Championship in franchise history. The fans cheered every player as they walked through the stadium’s gates, but the fan favorite was Leonard Fournette. The rookie running back went down the line of fans, thanking them for their support on his way to the team bus. Fournette was asked if he was confident that the Jags would bring home the AFC Championship. Some of the fans in line had a lot to say about Patriots quarterback Tom Brady’s hand – particularly among a group hailing Jaguars cornerback Jalen Ramsey as a king. Eventually, the team buses pulled out and headed north, leaving behind a group of die-hard fans who are bucking what Las Vegas oddsmakers have been saying all week; they’re betting on the Jags. “Take out a second mortgage, everything you own, cash it in. Bet it all on teal. We’re going to the Super Bowl,” an unnamed fan said. The fan said the bookies have been closing the gap on who they think the winner will be because they’re worried that they’re going to lose money. Jacksonville Mayor Lenny Curry was also in attendance. News4Jax asked him whether the city has any celebrations much bigger than the send-off if the Jags head to the Super Bowl. He said like Jaguars head coach Doug Marrone, he takes things one game at a time.